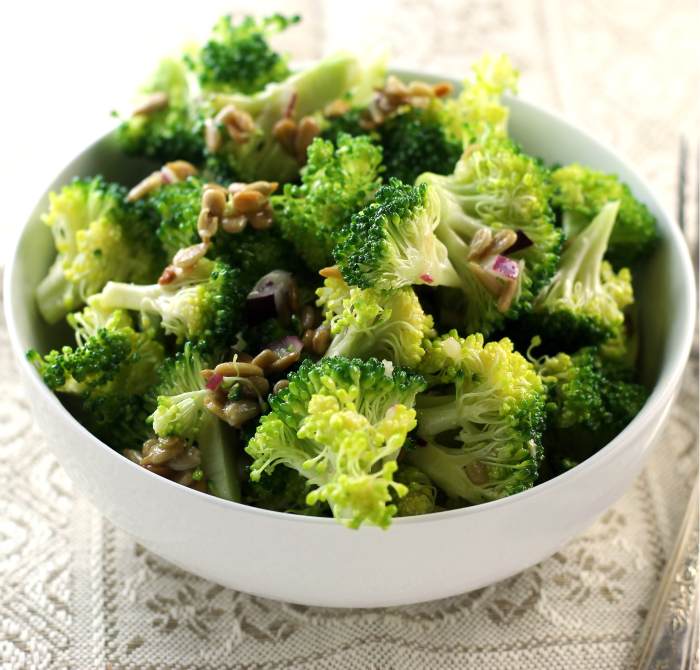 Broccoli Chopped Salad - Words of Deliciousness A healthy side dish... chopped broccoli salad. Looking for a healthy side dish? 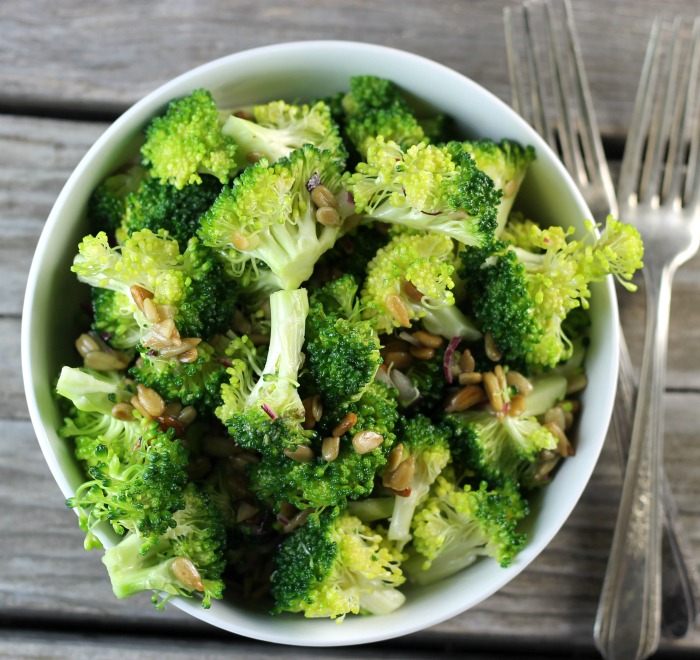 Try this broccoli chopped salad. It takes so little time and taste so yummy! I think that I beginning to have a love-hate relationship with this time of year. Yep, I love the holidays, with all the family around, the decorations, and all the pretty lights. Every year when the holidays are over I promise myself that next year will be different; I will get a jump start on everything and be ahead of the game. But every year the holidays sneak up on me and I seem to get behind, even before it all starts. I find myself getting a little anxious as the holidays start getting closer. That feeling comes over me that I will never find the time to finish everything in time. But then when the holidays get here, the anxious feelings goes away and it is always awesome. Do you know what I mean? Yeah, I know that I will get through everything just fine and will love seeing the family and friends throughout the holiday season. I did forget about all the food… during the holidays. How come there have to be so many calories in all the things that I love to eat during the Christmas season. I did make it through the Thanksgiving holiday, but I know that I packed on a few more pounds. The treadmill in my house keeps calling my name, and I know that I really have to get on it and walk a few miles each night. This brings me to my recipe that I am posting today. 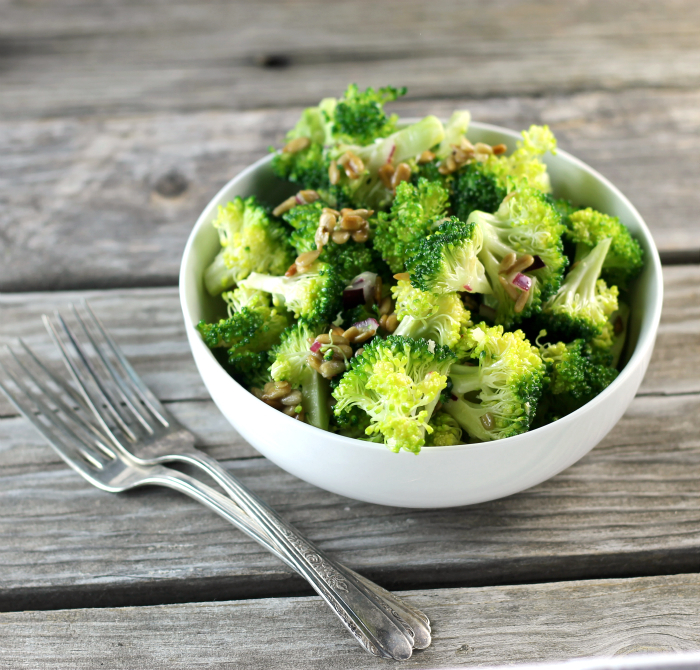 A simple broccoli chopped salad. Healthy, easy to make, and super tasty. There is no sugar, heavy mayonnaise, or sour cream to push up the calories on this salad. What there is, is a simple dressing with olive oil, white wine vinegar, honey, Dijon mustard, and garlic. I added a bit of red onion and a heavy dose of sunflower seeds to the salad, too. Yeah, I love the sunflower seed, so if you don’t like the amount that I have added feel free to cut down on the amount that you add. The honey gives the salad a touch of sweetness and the white wine vinegar and Dijon mustare give the salad the right tang. The combination goes perfect with the broccoli. Also the broccoli is not swimming in the dressing, I think that it is just the right amount. I have to add that when it comes to vegetables Mike is, let’s say he is a little picky, but he loved it. In a medium bowl add the chopped broccoli, red onions, and sunflower seeds. For the dressing in a small bowl add all of the ingredients except for the garlic, whisk together until all ingredients are combined. Whisk in the garlic. Pour the dressing over the broccoli and toss until the broccoli is coated with the dressing. I love broccoli prepared at any style..even just simply poached in salted water. Looks so tasty and healthy! 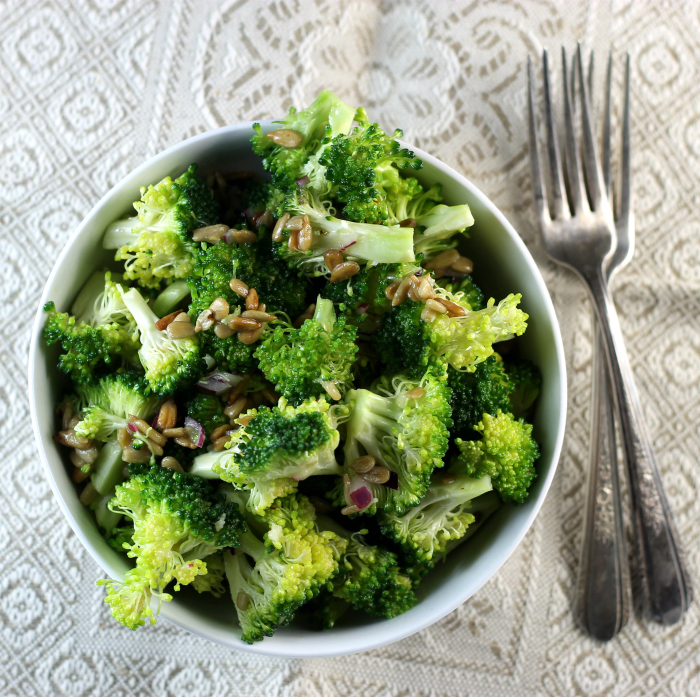 For some reason, broccoli always goes really well with nuts and seeds, so sunflower seeds are a great addition! Broccoli is one of my favorite veggies, this looks delicious. i always keep a bag of sunflower seeds around as well. Happy Holidays Dawn! Delicious looking salad Dawn…I love the vibrate green and the sunflower seeds. I like the sound of your dressing….yum! Fun idea! Great way to serve broccoli — I haven’t done anything like this. Definitely will try — we love broccoli! Thanks so much. With all the sweets around, your salad is just what I need! Simple, delicious and healthy!! !